I’m partial to an Alsatian wine every now and then, or a German one. They aren’t always hugely available and they’re rarely cheap so when I saw this Australian Alsace impersonator on sale in Waitrose with 20% off I thought I’d give it a go. The wine is pale and bright, and sort of thin-looking, there’s no thick legs hanging on to the glass, it swirls, water like around the glass. As it does so it smells of petrol, or maybe paraffin, a sort of filling-station light, but without the overhang smell of hot dogs that have been rolling for years. It tastes just dry with a crisp, bright, almost sharp acidity. I got a huge hit of fresh lime juice straight away, which was in contrast to the thick smell of petrol. I know a classic Riesling has that petrol and lime thing going on, but in this case they seemed like two totally different levels, as though I got on a bus and smelled petrol and then went upstairs to a lime market. It was a little disconcerting and not, I imagine, what the wine maker had in mind. I popped it in an ice sleeve to see if that would make a difference, and it did. As the wine cooled beyond refrigerator temperature by a couple of degrees the two elemoent melded together much better and, having married, produces a bit of almost tropical fruit blossom as their offspring, holding the wine together much better. The wine was on the light side in body as well as in alcohol. It did need that extra cooling to bring out the flavour and settle the aroma down a little bit. 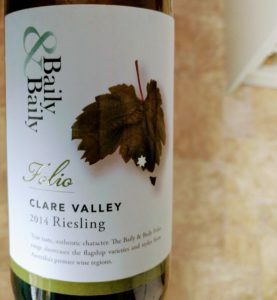 I enjoyed this Baily & Baily Folio Clare Valley Riesling ’14 at £6.50 from Waitrose (it’s also available from some of the Direct Wines wine of the month type clubs too), and I wouldn’t feel hard done to if I’d paid the ful £8 for it either. Just make sure you serve it good and cold for the best possible drinking experience.